Here's the collection to order to brighten your Thanksgiving Day celebration! The image brownie is cut from our fudgy Simply Divine Brownie base, dipped in fine white chocolate, and imprinted with a cornucopia image. Also included in this collection are the following: one cappuccino brownie, one peanut butter frosted brownie, one chocolate frosted brownie, one unfrosted brownie, and one creme de menthe frosted brownie. 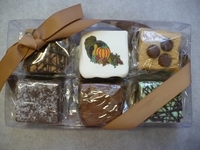 Each brownie is individually packaged in a clear, cellophane bag and the entire package is tied with a ribbon.